Congrats on moving to your new house. We understand that organizing a relocation and especially packing can be huge projects that require a lot of your energy. Remember, we are there for you through all of it, and we are just a phone call away. Especially if you are planning on packing big pieces of furniture yourself, it can be a hassle. One of those more complicated pieces of furniture will be your pool table. We will help by explaining how to prevent damage to your billiard table. 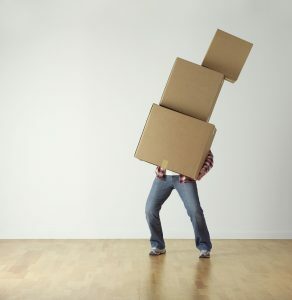 Even if hiring movers was deducted from expenses, you should still consider it. Moving a pool table is no joke, and you will see why through our steps. Billiards can weigh up to 1,000 pounds. Their robust measurements and weight make them a very difficult item to relocate. For these reasons, it’s very important to find someone who can help you pack your belongings. While we strongly recommend hiring professionals to guide all aspects of the disassembling and reassembling of the pool table, we understand that this isn’t possible for everyone. If hiring expert movers is deducted from your budget, it is manageable to move a pool table with the help of willing friends. Call your friends, because you’ll need all the help you can get. 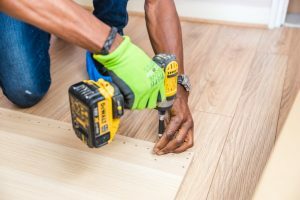 If you plan to move a billiard table without professionals, start gathering your supplies now – first you’ll need a toolbox. It should include a power drill, a screwdriver, a socket wrench, and plenty of blankets or bubble wrap for protection. A staple remover is a must, for removing the pool table’s felt. You can find staple removers at office supply stores, such as Office Depot or Staples. Important: Label everything. We suggest having plenty of labeled bags or boxes on standby where you can place screws and parts inside. Unfortunately, your car, no matter how big, won’t be enough. Even a van won’t do. Standard pool table sizes are around 7 ft., 8 ft., 8.5 ft. and 9 ft. long. 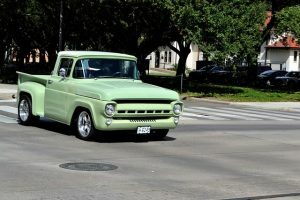 Depending on the size of it, you’ll probably need to rent a pickup truck or a box truck from a reliable mover. You will still need to rent a truck. 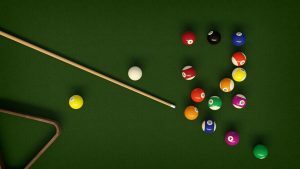 How to avoid damage when carrying and dissembling a pool table? Enlist as many helpers as you can for your DIY move. Four eyes are better than two, six are better than four and so on. But if the move is especially complex, involving narrow doorways or steep stairs, then we recommend hiring a specialty moving company to handle the project. This is an extremely important and useful tip, and it goes for all your furniture. Always measure any doorways, staircases or hallways that the item needs to pass through beforehand. This way you can assess how easy it will be to maneuver the pool table and its various parts through your home. Also, be sure to open the doors, and properly protect the floors and walls before beginning the moving process. We always recommend covering any sharp edges with some bumpers or thick towels before handling a heavy item through your home. You’ve enlisted your friends, and gathered your materials, now you’re finally ready to disassemble the pool table. Remove the table’s six-ball pockets by taking out the staples that keep them in place. If your pool table’s pockets are screwed in place, you’ll need to remove them with a screwdriver instead of a staple remover. Next, tackle the pool table’s side rails using a socket wrench. Once the bolts are unscrewed, gently remove each side rail. Store all bolt and screws separately, and be sure to clearly label each part. Now it’s time to remove the felt on the top of the pool table. To successfully remove stapled felt, use a staple remover and carefully pull out each staple. Do your best not to rip or damage the felt in the removable process. After the felt, it’s time to deal with your billiard table’s slates. Warning: pool table slates are heavy. For example, a one-piece slate usually weighs around 450 pounds. That is where your strong friends come in. You will need all the manpower you can get to remove the slates without breaking something. Once the pockets, rails, and slates have been removed, you can move on to the main body and legs of the pool table. All you have to do is remove each pool table leg from the main structure. To make this easier, you may need to turn the main body of a pool table on its side or upside-down. Thoroughly wrap each part the of the pool table in moving blankets, and bubble wrap, and everything possible. When loading the pool table onto the truck, it’s extremely important that you protect the slates, because even though they are extremely heavy, they are also very delicate. After the pool table is in the truck, drive carefully to prevent slates and other items from breaking around while in transport. How to prevent damage to your billiard table while reassembling it like a pro? Putting it back together at your new house can be tricky. But with the help of your strong and patient friends, start doing the opposite of what you did before. Reattach the legs to the main structure. Once the legs are reattached, add the slate and felt on top. Then attach all rails and pockets. Be extremely careful when leveling your table or it will ruin your future games. Reattaching the felt to the pool table in a completely smooth way is tricky, and is usually best left to professionals. If you call us to help you with the heavy lifting, you can focus on other more important things. If moving a pool table by yourself sounds too much of a hassle or it is simply overwhelming, it is (as always) a good idea to hire Pro Movers Miami. We are your experienced experts for the job. Those affordable movers you need are near you, so look no further, we will be your capable friends in need!